Poison Dart Frogs (frogs in the Dendrobatidae family) are small, brightly colored frogs that are native to Central and South America, and have been introduced to Hawaii where they successfully thrive. They were given the name 'Dart Frogs' because tribes have used the toxic secretions from some species in blow dart tips, but the kind of poison used in these darts have been found in only 5 species of the dart frog. Captive dart frogs do not have the same skin toxin as wild dart frogs because the toxin is actually synthesized by the frog from the alkaloid prey they consume in the wild. 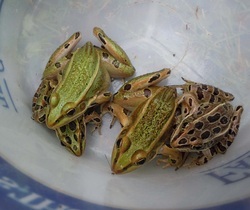 The captive bred diet does not contain the same ingredients to produce the alkaloid toxin, but if the frog were put back into his natural habitat and had access to the alkaloid prey it would begin to produce the toxin again. The defense trait still does exist in captive bred frogs. Poison dart frogs are amphibians and begin their lives as tadpoles. Female dart frogs lay their eggs in moist areas such as the base of plants, and when the eggs hatch, they carry the tadpoles on their backs to water for them to develop further. The female dart frog lays infertile eggs frequently to feed her young. Males have a brighter color pattern than females and are more aggressive. Females will eat the eggs of other females and compete for the best laying areas. In captivity, dart frogs do well in groups when allowed 10 gallons of space per frog. Dart frogs have been known to live over 20 years in captivity, with the average being 10-15 years when kept properly. They need a vivarium that can retain 80-100% relative humidity which can be achieved by providing an enclosure with no ventilation. Live plants and a suitable substrate that retains moisture are vital to keep the proper environment for your frog. The substrate should be replaced every 3-5 years and leaf litter should be added every 6 months. Maintain the vivarium by keeping plants in good condition and to proper size as they grow, misting as needed, and wiping glass to keep mold and algae down. They do best in temperature ranging from 60-80*F, with the ideal temperature being in the mid-70s. Heat is damaging to dart frogs, so it is important to keep the temperature below 80*F. The dart frog diet should consist of flightless fruit flies, springtails, aphids, phoenix worms and pinhead crickets. Dart frogs should not be handled except when moving them as necessary. The toxin in captive bred dart frogs is not harmful to humans, but your skin oil can be harmful to the frogs. Josh's Frogs is the online authority on captive bred Dart Frogs. The selection is amazingly large, and the care they give their frogs is unparalleled. Their kits are care sheets are up to the highest standards, and their website is brimming with information...and frogs! Research of a new species BEFORE you buy is so important. Read this guide 'Preparing for Dart Frogs' to make sure you know what you need to know to have success with your first Poison Dart Frog. Leopard Frog Shocker A new species discovered in New York city.